49 Move-ins in 1 Month! Already on record as the quickest timeframe for attaining 70% pre-sales in the state of California (verified by Cain Brothers), Fountainview at Gonda Westside in west Los Angeles has achieved yet another milestone: 49 move-ins in one month! 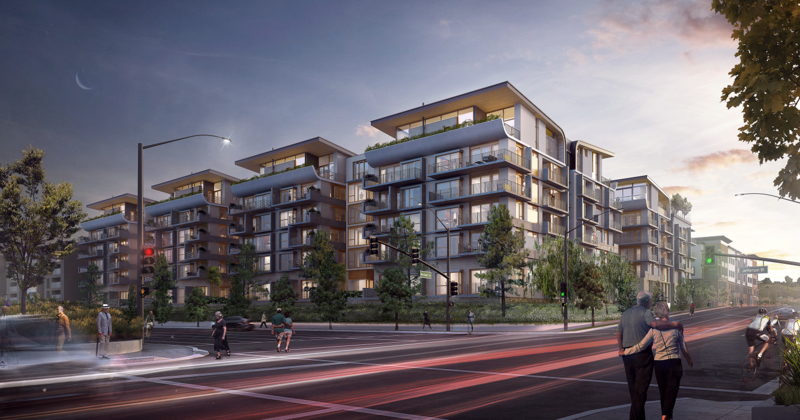 Located in Playa Vista, a new walkable urban community on the west side of Los Angeles, Fountainview at Gonda Westside is a shiny new glass-enclosed tower featuring views of downtown LA and the Santa Monica mountains. A roof top swimming pool, spa and fitness center are just a few of the many outstanding features of this ultra-modern and luxurious community. Apartments are loaded with contemporary features such as granite countertops, glass-tiled back splashes, upmarket stainless steel appliances, rainfall showerheads and more. A state-of-the-art theatre, light-filled art studio and trendy wine bar are some of the community’s many stylish amenities. A steaming hot housing market in LA resulted in many depositors selling their homes within days or weeks of putting them on the market. Yet a delay in obtaining the certificate of occupancy caused a backlog of depositors anxious to move in. As a result, all throughout February and March it was ‘all hands on deck’ as the sales team, department heads and management worked tirelessly into the evenings and over weekends to move-in as many as possible and as smoothly as possible. In March alone, 49 residents were moved in, a near-Herculean effort! To date, 80 residents have settled into their new home with more to come! Solutions Advisors was first retained in November 2012 to provide marketing and sales management for this planned 175-apartment luxury community sponsored by the LA Jewish Home. Within 11 months of opening of the sales center, the community was 70% pre-sold. Solutions Advisors continued sales and marketing management throughout the project’s construction, partnering with the sales team to achieve 100% pre-sales and a waiting list of over 50 households.